A dear friend of mine, Rachel Kapustka, recently received a gift of love and life in the form of a donated kidney. This has gotten me to think deeply about how we take care of our bodies. It seems to be especially easy to neglect our hard-working organs, the unsung heroes of our daily function and well-being. Maybe we “cleanse” the liver from time to time, or pay attention to our lungs when they’re irritated, but for the most part we just assume our organs are happy to fulfill our daily tasks without so much as a thank you. So, I created this cleanse to take a few days (10 to be precise!) to nourish, cleanse and love on our bodies, with a special focus on our organs. Through this process, I have also had the opportunity to more profoundly understand just how much trouble our health care system is truly in. Rachel has “good” insurance and once diagnosed with end-stage renal failure, Medicare was able to jump in to support her health care costs. But only for 3 years. Rachel, and all organ recipients, are required to be on very expensive anti-rejection medications for the rest of their lives. This health expense is not only NOT completely covered by both of her insurances, but will likely not be covered at all after 3 years. 100% of the proceeds from this cleanse will go directly to Rachel and her amazing family via their GoFundMe site. My hope is to raise awareness not only for ourselves and encourage more pro-active body-loving (! ), but to also raise awareness about how much so many individuals are impacted by our less-than-perfect healthcare system. 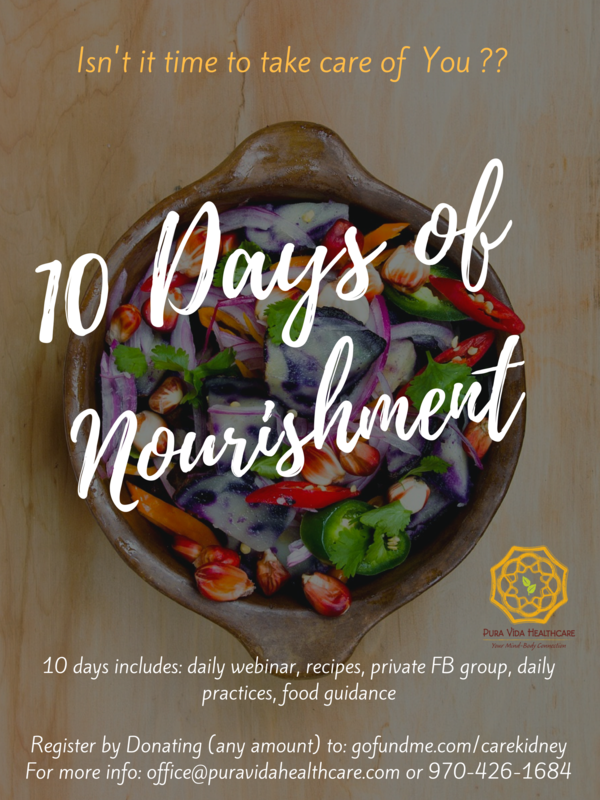 The cleanse will last 10 days total, including 3 days on each end to “prep” the body to heal on a deep level. We will not be juice or water fasting, so you don’t have to worry about being hungry. We will make diet and lifestyle modifications that can be individualized to make it a great fit for you. There will be daily webinars that you can listen to live at a specified time or recorded at your convenience. We will have guest lecturers so we get a wide variety of perspectives about self-care, prevention and more! We will also create a FaceBook group where we can share recipes, successes, hurdles and cheer each other on. This will be on-line only, so you can participate from any location and time zone in the world! 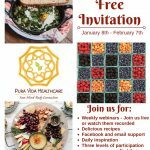 If you can’t make the live webinar, you’ll have access to a recording so you can listen at anytime. FaceBook Group with access to me to answer questions or concerns and come back to for reference. Tools to change your life and create even more good stuff in your world!